Okay, I made out like a bandit this Christmas and Birthday. The flip side is I have a pile of “To-Read” books as tall as my leg. 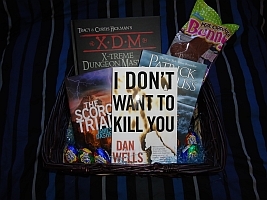 To top it all off, I just got my Easter Basket book in yesterday, the finisher of Dan Wells’ “Serial Killer” series, entitled I Don’t Want To Kill You. It’s hard to communicate exactly what this means. Okay, I’ll start with a list. Now let me say, I’ve been looking forward to each and every one of these books for one reason or another, and for a good amount of time per book. After quitting WOW I found I actually had the ability to finish a book from time to time, but with School, Work Study, and a long-distance relationship, it still takes awhile. I had to take on a pretty strict “Book List” rule – no buying new books until I finish the list. New books go to the end of the list. I Don’t Want to Kill You is one of those books you break the rules for. When the second book of the series (Mr. Monster) came in the mail for my birthday (My fiance rocks, by the way) I had just stayed up all night studying for a huge test. When I got home, I was ready to crash for at least 14 hours. Then I got the mail. I decided to crack open the book for a minute before bed. I didn’t get to sleep; instead I read the entire book that afternoon. That was a year ago, and I have eagerly been awaiting my chance to read IDWTKY ever since. Thus, Dan Wells gets special treatment – his book is the one that gets to jump the queue.